Nigeria has one of the highest rates of maternal mortality in the world: women there have a 1 in 23 lifetime risk of dying in childbirth. In 2010, a five-year Rotary pilot project concluded in the rural northern states of Kaduna and Kano Nigeria. Led by the Rotarian Action Group for Population Growth & Sustainable Development (RFPD) and supported by Rotary members and public and private partners in Germany, Austria, and Nigeria, this US$3 million initiative reached nearly one million at-risk women of childbearing age. Through an array of awareness and advocacy campaigns and hospital-based interventions, the rate of maternal mortality in ten participating hospitals was reduced by 60% and newborn mortality by 15%. To ensure sustainability, the state governments of Kano and Kaduna were given control of the program, which continues to this day. This amazing program all resulted from a meeting of two Rotarians 20 years ago. 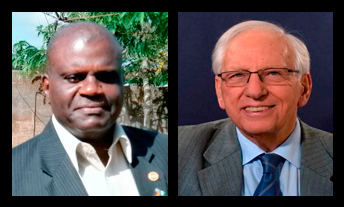 Emmanuel Adedolapo (Dolapo) Lufadeju from Nigeria and Robert Zinser from Germany met at the 1994 International Assembly as incoming district governors. The two men had a conversation at the first coffee break and they’ve been close friends and collaborators ever since. We asked Dolapo and Robert to reflect back on their first meeting and how it led to one of Rotary’s most impactful maternal and child health projects. What did you talk about in your first conversation, and what made you each decide you wanted to work with the other? Dolapo: As incoming governors we talked about population concerns and thought about possible ways of tackling this issue through Rotary projects. I could not only hear Robert’s interest in the conversation but also saw his commitment to help in his eyes and learned from him about his experience as a manager in a third world setting. Robert: Hearing from Dolapo that he is an agriculturalist I was very interested in his analysis of the reasons and obstacles for the plight of the poor and asked him for a needs assessment. Feeling that the population concern he raised is a global concern I asked him for a project proposal which I could discuss with the incoming club presidents in my district. You come from very different cultural backgrounds. Were there any special challenges you had to overcome as you began working together? Dolapo: I had to learn to cope with Robert’s fast pace and respond quickly to communications. While I was very busy as a governor in my large district, Robert invited me to attend his district conference in Germany and later insisted that I should come to meet him at the first Population Conference of Rotary International in Dakar, Senegal, which was a long and adventurous trip by bus and ship for me. Robert: Having taken to heart the RI theme “BE A FRIEND” at the 1994 International Assembly we did not experience problems in working together. Of course, I had to get used to African habits, but we quickly sorted out the difference between Nigerian time (“fixed time plus x”) and German time (“punctual”) [laughing]. What advice would you give to a Rotarian who wants to take the first step in establishing a partnership like yours? Dolapo: To meet the person and explore common interests, develop and cultivate friendship and trust. Be dedicated to the common issue. Be open-minded, devote time and be willing to work hard. Robert: The most important thing is sharing a passion for the same goals. Ideally these goals should be linked to one (or more) of Rotary’s areas of focus, since these are global aims that can be best contributed to through Rotary’s network. Project work—from planning to implementation—is the best way of truly getting to know another person and building up trust and a strong friendship. Our absolutely reliable contact is the basis of our 20 year long friendship and partnership in ongoing successful project work. Learn more about Robert and Dolapo’s work by visiting RFPD’s maternal health program website, www.maternal-health.org.